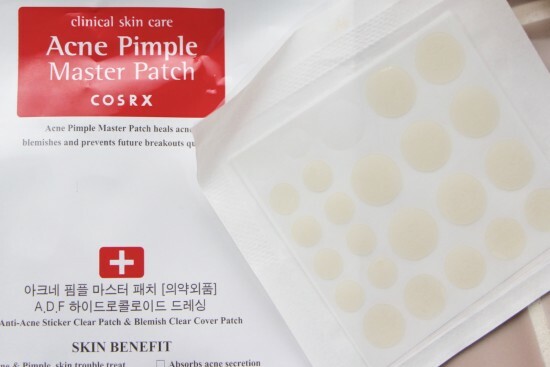 The Acne Pimple Master Patch from COSRX is actually a set of twenty-four patches, which makes me want to write “es” after “patch” on the packaging in Tippex. But that, I have to say, is my one and only complaint (and it’s a silly, pedantic one) when it comes to the Acne Pimple Patches. I’m not sure how helpful the Master Patches would be if you did actually have proper acne, because if you have quite a few spots then I can’t imagine it would be convenient or cost-effective to have to regularly apply multiple patches. And it is often hard to distinguish individual spots, if you have acne – I remember that one of the worst things about my adult acne breakouts was the fact that the large expanses of reddened, bumpy, sore skin behaved like one gigantic super-spot, now and then kindly throwing up a standalone pimple with a squeezable head. But for the readily-distinguishable, in-your-face spot, one with an outline and an almost-emerging head, the Master Patches are absolutely brilliant. Actually, even if the spot doesn’t have an emerging head, the patches still work a certain degree of magic. I’ve been totally rescued by the Master Patches on a number of occasions now, each time finding that my blemish has flattened, de-reddened and – ultimately – disappeared from my face much faster. The added benefit of having a patch stuck over your spot (and it really does stick!) is that you can’t poke and prod and squeeze, so the skin can be left to heal. And the patches absorb the gunk that comes out of the spot (nice! ), the gunk that usually, if you’re anything like me, you’d be sticking your grubbster fingers into all day long, poking about and making little streams of blood appear and then dabbing with acid and swearing very loudly. There are three patch sizes in the pack – so far I’ve only needed the small ones for daytime emergencies, but overnight I’d perhaps go larger just to cover a bit more than just the slopes of the volcano. You stick to clean skin and then just leave for the night, or day, until you can see that the spot is flatter and reduced in size. I’ve left a patch on for sixteen hours and it was still stuck fast – it was the first time I’d used one and I was completely taken aback when I peeled it off to find just a faint pinkish blob where previously there had been the beginnings of a devil’s horn! I was given my patches by the beauty-font-of-knowledge Alexia from Cult Beauty, but they don’t seem to be available there at the moment. I’ll find out when or if they are due to arrive and update this post when I know, but in the meantime I have found them online here. I must say that this is another big tick in my book for Korean beauty imports; I’ve tried a few other spot patches and they’ve been pretty useless. And pricier. So these are well worth checking out if you – like me – get the occasional show-stopper of a pimple, right before you have to face the public/go to Tesco/meet your boyfriend behind the bike sheds. The post The Magic Pimple Master Patch Review appeared first on A Model Recommends. We are all far more diligent with facial SPF than we used to be – we all know that to ward off the hands of time and of course to protect our skin from damage and potentially skin cancer that the SPF contained within our day-to-day products such as make-up and skincare simply doesn’t cut it. Applying a high factor, daily and facial SPF before you’ve applied your make-up is the easy part but what about protection as the hours tick by and removing your make-up is not option – Pixi Sun Mist that’s what. This newly launched SPF 30 spray will be all anyone uses and talks about this Summer, that you can count on. The best way to describe the Pixi Sun Mist is multi-tasking: it offers instant (like any SPF it does require 15 minutes to fully kick into play) sun protection from all forms of UV rays including infrared rays, as well as quickly and efficiently refreshing the complexion (it contains bamboo and chamomile extract to soothe and soften too) – something we will all be grateful for come the balmy days of June and July. A broad-spectrum facial SPF that is non-greasy, lightweight, comfortable and easy to apply is one thing and truthfully quite a rare occurrence but one that is effective applied on bare skin and over make-up is a rare treat indeed, and that alone is what makes the Pixi Sun Mist special. It feels all but weightless on the skin – regardless of how you apply it – does not clog the pores nor irritate eye the most sensitive eyes, making it suitable for all and if that doesn’t sway you, it won’t remove make-up when applied and certainly won’t leave you feeling nor looking oily – something we can’t say about all sunscreen products. To apply you have two methods: one is to mist the Pixi Sun Mist directly onto the face (or anywhere else you would like to protect – it is great to apply to the hands after washing etc) and enjoy the benefit of a cooling, veil of SPF30 protection. The other option is to squirt the mist directly into the palms of the hands and then pat the product directly onto the face for precise and full protection. Pixi Sun Mist: £18/80ml via M&S (the only place in which it currently isn’t sold out) – link.